Is the beeping of a work truck backing-up music to your ears? Ever seen a backhoe dig a hole and wanted in on some of that sweet action? Well, not only did someone think about it, they thought about it twice! Thus, Construction Simulator 2 was born! This port of the well-received Android and iOS game of the same name attempts to bring its success to console. Unfortunately, it hits too many potholes for a game about repaving roads. My journey into the magical world of heavy vehicles and hard labor begins with my character getting his startup construction company off the ground. The tutorial has a guy named Pete teach me the basics of the camera controls, context menu, and vehicle controls. The context menu opens a list of actions that can be performed from the current vehicle you are piloting. I can view technical information, turn the headlights on and off, and toggle function mode for some machines. For the vehicle at hand, the backhoe, this anchors the machine in place and switches control to the excavator’s arm. Pete tasks me with digging a hole to be sure I can function in the business. You maneuver each part of the crane arm with one of the two analog sticks. The left controls the base of the crane arm, while the right manipulates the forward arm and the bucket. Once I had a handle on the device, I was able to smoothly dip the bucket in and out of the ground with ease. The camera is less intuitive, requiring you to switch the right analog stick’s function between camera control and vehicle control. This makes for an awkward view when working. However, I soon had a pile of dirt I could be proud of and after teaching me the basics of the flatbed truck crane, Pete had me on my way to building my construction empire. My character then offers Pete a job as a foreman and our journey into business begins as we drive the flatbed into the sunset. In an attempt to be as realistic a simulator as it can, the game even requires you to follow traffic laws. Running red lights or colliding with cars will net you violation tickets. Now, these never add up to much more than mild annoyance. The largest traffic ticket I received only cost me two hundred credits. This is chump change considering even early jobs pay in the tens of thousands. Thankfully, the option to turn off traffic violations is present. I felt I had all the simulated fun of waiting at red lights in real time that I could after the first occasion. But driving around town in vehicles that top out at anywhere from forty to three miles per hour does not lend well to exploring. Yet exploration is actually encouraged by several hidden medals, which the game doesn’t even tell you how to interact with. They require you to open the construction view highlight, swapping to “control” of the medal, and then using the context menu to collect it. This sequence of actions is never even hinted at, and I spent more time than I’ll admit poking around in a tree with a crane trying to pick up the prize. These at least are optional, but the larger offender here is finding important required locations. 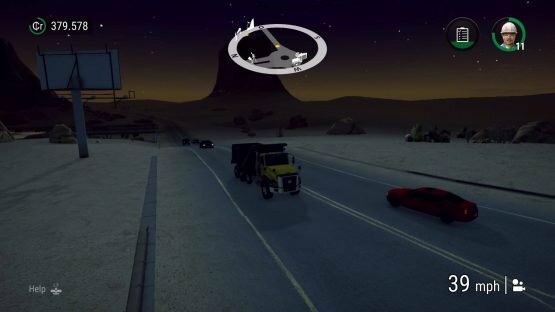 The last part of the tutorial at least has you driving around the initial area, Desert Springs, finding your suppliers and vehicle dealers. But the map does not show you places you need to go unless you have already been there. So when I was tasked to deliver materials to the gravel pit, I was suddenly lost. There were no map icons or any indication of where I was supposed to look for this place, and several jobs started requiring trips there. At least there is a skip drive function to avoid repeating the tedious parts of back and forth driving, though it will cost you a small delivery fee based on the distance shipped. The true meat of the simulator is, of course, the simulated construction itself. The early vehicles control smoothly, and once you have familiarized yourself with the control scheme, it becomes second nature to manipulate them. Most of my early jobs consisted of minor tasks. Several simply required digging a hole for a foundation or delivering materials to a work site. Some jobs even try to add story elements, all of which are told through conversations between Pete and the protagonist. But usually you are simply given a task to follow, and the story bits didn’t really feel necessary most of the time. When I really started getting into the routine of the presented task, it became an enjoyable experience. Never have I so enjoyed digging a hole in the ground. But alternatively, never have I been so frustrated when a simple task suddenly becomes undoable. My time with this game was riddled with glitches that caused several sections of gameplay to take several times longer than they should or become altogether impossible. Delivery areas would be blocked by invisible walls that prevented me from dropping anything in the required spot. Sections of ground I was digging suddenly became impenetrable, stopping my progress for up to thirty minutes. Twice, one of the many tumbleweeds rolling around town blew into my worksite and rolled directly onto the pipe I was supposed to remove. Clearly, this thing was made of adamantium and laced with orichalcum, because it brought my backhoe to a complete halt. There was no recourse but to completely remove the vehicle and wait for the indestructible bramble to be on its way. It took its time. There is an option to skip steps of any given job, but you do not receive the payment, and you can lose large sums of money through no fault of your own. Player progression is marked by making profits and buying new machines. This gains you access to bigger jobs with bigger payouts. After making enough headway I was offered jobs that allowed me to move my enterprise forward into new locations. This, in turn, offered new vehicles and new types of jobs to complete. Moving up from digging holes for the crazy local with a dousing rod to paving new streets and building houses felt like my company really was moving up in the world. Aside from the tedium of having to find all your business suppliers all over again in each new town, it was satisfying to do new, more complicated tasks. Unfortunately, the newer and bigger vehicles introduce more glaring problems. The camera on several of the larger cranes focuses on the base of the vehicle itself, rather than on the hooks or arms you are controlling. This makes for a difficult time picking up materials or pieces of a house. This can force you to move the hook blindly and spam the button for attaching an object. Other times parts would fall through the ground and refuse to attach. And my shiny new excavator wished so greatly to be a flying machine that it simply took off into the air from a near standstill, flipping wildly through the sky before skidding across the workplace on its side. The game was enjoyable when it worked. However, there are far too many times that it didn’t work that marred my experience. Like many contractors I’ve dealt with in real life, the game left the job half-finished and with its paycheck anyway. Keep the barrels out and the safety lights on, because this one still needs some work. 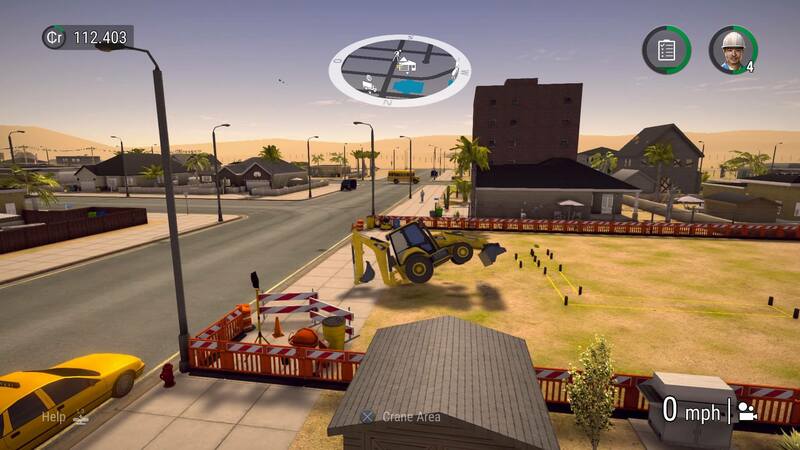 Construction Simulator 2 – Console Edition review code provided by Astragon Entertainment GmbH. Version 1.00 reviewed on a PlayStation 4 Slim. For more information on scoring please see our Review Policy here.